Cup action all the way in Cambridgeshire this Sunday with the League Cup group games resuming. There was also one tie in the Cambridgeshire Women’s Invitation Cup 1st Round with Championship South side, Park Ladies hosting Championship North side Wisbech St Mary Ladies. The two sides enjoying a good contest with the tie going all the way to a penalty shootout. Park Ladies edging a close 1st half leading 1-0. The hosts scoring again in the 2nd half Darcie Tegerdine and Sherrie Martin with Park’s goals. Wisbech St Mary seeing the game end all square after the 90 minutes getting 2 themselves in the 2nd half, Megan Ratcliffe and Hannah Shales with the goals. No further goals in extra-time the tie settled by penalties, Park celebrating at the end going through to the quarter finals winning the shootout 4-2. An away trip to Wisbech Town Ladies awaits. The group games in this season’s League Cup competition continuing this Sunday with 6 games taking place. In Group A, Ketton Ladies become joint leaders after the Championship North side at home beat Premiership side Netherton United Ladies. A single goal enough to secure the 3 points. One game too in Group B, Premiership side, March Town United Ladies topping the mini-league with 3 wins from 3 now. Away to Championship North side Hungate Rovers Ladies this Sunday. March leading 1-0 at half-time went on to dominate the 2nd half to run out 5-0 winners. Louise Barbour scoring twice. Emma Frost, Ella Nutter and Adele Munday all getting a goal each. Two games from Group C, in the early kick-off Premiership leaders, Cambridge City Ladies Development were away playing Cambridge Rangers Women from the Championship South. Megan Tonks putting Cambridge City into an early lead scoring after 5 minutes. Cambridge Rangers getting back on level terns on the half hour went on to take the lead in the 38th minute. Cambridge City responding quickly Tonks finding the back of the net for her 2nd of the game to make it 2-2 a strong end to the 1st half seeing the visitors score twice more Yasmin Crow and Rachel Littlewood with the goals putting Cambridge City 4-2 up at half-time. The visiting side adding one more goal in the 2nd half Jade Powell firing the ball home from a free-kick. Cambridge City winning 3 from 3 to top the group. Also in Group C it was an all Premiership clash between Riverside Ladies and Histon Ladies Reserves on Sunday. The Peterborough based side claiming their 2nd win in the group to join St Ives Town Development on 6 points. Annie Posnett scoring a hat-trick. Hannah Stubbs and Jade Ramm also scoring in a 5-0 win for Riverside. Two games also in Group D. Haverhill Rovers Ladies topping the table with 2 wins from 2. Have 20 goals from those 2 matches too, 8 in their win over Premiership side Fulbourn Institute Bluebirds, scored 12 without reply away from home against Burwell Tigers Ladies this Sunday. Joeli Kirby scoring 4 goals in the game. Emma Barnes netting herself a hat-trick. The other Haverhill goals shared between, Hayley Turner, Julie Brown, Kayleigh Nolan, Amy Evans and Kayleigh Steed. Fulbourn Institute Bluebirds picked up their 1st group win in the League Cup this Sunday at home to fellow Premiership side, Cambridge University Women. A close game Fulbourn scoring twice with Katie Luddy and Marie Stubbings both on the scoresheet. The hosts winning 2-1 with Amanda Wainwright scoring for Cambridge University. This entry was posted in Cambridgeshire Women's Invitation Cup, Cambridgeshire Women's League Cup, The Round-Up and tagged Cambridgeshire Women's Invitation Cup, Cambridgeshire Women's League Cup, The Round-Up on October 31, 2018 by WFEast. One game played in Beds & Herts Women’s Division One this Sunday. Leaders, Welwyn Pegasus Sapphires away to the defending Champions, St Albans Ladies. Sophie Lawrence scoring in the 1st minute to put St Albans into the lead, Jessica McNamara scoring for the hosts in the 22nd minute. Janiece Allen making her first start for the Sapphires celebrating a hat-trick. Ellen Slater scoring for St Albans in the final 3 minutes to see the game end all square a point each, 3-3 the final score. One outstanding tie from the 1st Round of the Beds & Herts Women’s Cup the much delayed fixtures between Division One sides, Garston Ladies 2nd XI and Northwood Ladies. Two goals in 5 minutes past the half hour for Emma Steele. The visitors going on to take control of the tie in the 2nd half with two more quick goals on the hour from Scarlett Keightley and Danielle Aken. Leanne Jones scoring a 5th for Northwood in the last five minutes to see them safely though to the 2nd Round. Charley Kelsey with the goal for Garston. Hitchin Town Ladies move 4 points clear at the top of Beds & Herts Women’s Division Two. The league leaders at home playing Welwyn Pegasus Azures. Hitchin Town taking the lead inside 15 minutes with Louise Gash on target to score. Two goals from Kirsty Smith past the half hour seeing Hitchin go 3-0 in front, Welwyn Pegasus Azures responding well pulling it back to 3-1 straight away reduced the deficit to a single goal scoring from a corner in 1st half stoppage time. Hitchin Town defending their 3-2 lead going into the final 15 minutes, Gash held inside the box the hosts awarded a penalty, captain Emma Chaffey putting it away. Gash getting her 2nd of the game in the closing minutes to see Hitchin Town win 5-2. A 3rd win of the season sees Letchworth Garden City Eagles climbing the Division Two table up into 2nd spot after Sunday’s results. At home were playing Watton Ladies. Alyce Williams scoring a hat-trick. Emily Jamieson and Tayla Murray both scoring a goal, whilst there were 1st goals of the season for Alex Bush and Amy Atsma. Letchworth winning the game 7-1. A mid-table clash saw Evergreen Ladies hosting Bedford Ladies Development on Sunday in Division Two. Rebecca Freeman with her 6th goal of the season putting Evergreen into the lead. A last gasp equaliser rescuing a point for Bedford Ladies Development, Sarah Ridley on target with the goal late on to see the sides draw 1-1. A first league win of the season for Wheathampstead Wanderers Ladies following promotion to Division Two. At home to Evergreen Eagles on Sunday. Wheathampstead had only scored twice in their previous 5 games. More than doubled that tally this weekend to get their 1st points on the board courtesy of a 3-0 win. Langford Ladies are six points clear at the top of Beds & Herts Women’s Division Three after they won their 5th successive league game on Sunday. A big win too away to Buntingford Town Ladies. Another hat-trick for top scorer Amber Clark now has 14 goals to her name. Chloe Scott moves onto 9 goals for the season after adding another 2 goals for Langford. 4 more goalscorers too with Langford running out 9-0 winners, 1st goals of the season for Abigail Stock and Tabitha Brown with Rebecca Reeve and Danielle Vince also scoring. Looking to catch Langford at the top of the table are AFC Kempston Town & Bedford College Ladies playing just their 3rd league game this Sunday have a 100% record at the start of the season, climb back into 2nd position with victory at home against Bedwell Rangers Ladies. Bex Cray with a hat-trick in the match has 8 goals now from 5 appearances. Zara Garrard and Rachael Mumford with a goal each in the game. Georgia Miller with both goals for Bedwell Rangers. This entry was posted in Beds & Herts Women's Division One, Beds & Herts Women's Division Three, Beds & Herts Women's Division Two, Beds & Herts Women's League Cup, The Round-Up and tagged Beds and Herts Women's Division One, Beds and Herts Women's Division Three, Beds and Herts Women's Division Two, Beds and Herts Women's League Cup, The Round-Up on October 31, 2018 by WFEast. 6 wins from 6 now for Frontiers Ladies as they continue to lead the way in the Essex Women’s Premier Division. 3 points clear of 2nd placed Leigh Ramblers Ladies. Their latest 3 point haul coming on the road the Harlow based side visiting Southend United Ladies. Dempsey Favell opening the scoring. Kay Foy on target to make it 2-0 before Favell would add her 2nd goal of the game. Charley Sandford and Kelly Holsworth also on the scoresheet as Frontier ran out 5-0 winners. Leigh Ramblers Ladies in 2nd have won 5 league matches in a row now their only defeat coming on the opening day. Were on the road on Sunday taking on bottom side Brentwood Town Ladies Reserves who struggling for numbers at the start of the season were playing for just the 3rd time this campaign. Lauren Knight scoring for Brentwood in the 15th minute, it was a close 1st half with Leigh Ramblers holding a 2-1 advantage. Leigh Ramblers the better side in the 2nd half as they found the back of the net for 4 more goals to win the game 6-1. Rebecca Dalgarno and Kate Newton both scoring a brace. Aimee Skinner and Emily Diwell both celebrating a goal. 5th placed Chelmsford City Ladies were at home on Sunday taking on Beacon Hill Rovers Ladies. The sides sharing 6 goals between them, shared the points too with the game ending all square at 3-3. Georgia James, Shannon Kelly and Niki Medici all on target for Chelmsford City. Jo Smeaton the scorer of all three goals for Beacon Hill Rovers. A first league win of the season for Collier Row Tigers on Sunday lifts them up to 6th in the Premier Division table. A big win to coming away to Silver End United Ladies. Both Sarah Finch and Emily Dempsey hitting 4 goals apiece. Laura Bunton last seasons top scorer getting her first goal of the new campaign. Collier Row Tigers winning 9-1. Abigail Head scoring in her 1st start for Silver End United. A 100% winning start for the leaders of Essex Women’s Division One too as Dagenham & Redbridge Ladies continue their excellent start to the season winning for the 6th time to remain 3 points clear at the top of the table. On the road this Sunday playing Hutton Ladies Reserves, top scorer Amy Jacobs keeping up hr fine form in front of goal scoring a hat-trick to move her onto 22 goals from 6 appearances. Grace Tebb-Reading also scoring for Dagenham & Redbridge along with Stephanie Males who netted her 1st goal of the season in a 5-2 win. Rachael Agombar and Casandra Piejko with her 1st of the season getting the goals for Hutton Ladies Reserves. Elsewhere in Division One their were huge wins for the sides looking to chase Dagenham & Redbridge down. 2nd place Billericay Town Ladies at home to Island Ladies are scoring plenty of goals their biggest win of the season 14-0 on the opening day, they matched that total again this Sunday to move onto 15 points from 6 played. Alexandra Baker making her first start of the season celebrating at hat-trick. Both |Hope Strauss and top scorer Lisa Robins both getting a brace. Emilia Dingwall on target with a goal along with 6 players all getting their 1st goals of the season, Alicia Woodward, Anna-Marie Rains, Rachel Armstrong-Morris, Grace Lane, Emma Roberts & Grace Wooley. It was a 14-0 winning score to for Rayleigh Town Ladies putting them back up into 3rd postponed games meaning they hadn’t played since the start of the month that their only defeat of the season like Billericay coming against Dagenham & Redbridge. Away to Chelmsford City Ladies Reserves this Sunday piled on the goals once again. Captain Isabelle Wallings had 14 goals already this season from 3 league games, including a 10 goal haul in one match claimed a further 8 this weekend moving her onto 22 goals. Megan Harley moves into double figures herself netting a hat-trick, likewise Eleasha Reeves bagging a brace has 11 goals now. Holly Gash with her 6th goal of the season scoring too for Rayleigh Town. FC Clacton Ladies climb up to 5th in Division One, their points tally reaching double figures, an away trip to Chigwell Ladies on Sunday afternoon. A brace from Becky McDougall and a goal for Amy Hartley securing a 3-0 win for the visitors. Leigh Ramblers Reserves in 7th position also have 10 points on the board in Division One their 3rd win of the season coming this Sunday at home against bottom side Belhus Ladies. Goals form Amy Chester and Louise Mazirel-Cowell seeing the hosts win the match 2-0. This entry was posted in Essex Women's Division One, Essex Women's Premier Division, The Round-Up and tagged Essex Women's Division One, Essex Women's Premier Division, The Round-Up on October 31, 2018 by WFEast. The top two in Norfolk Women’s Division One met for the first time this season on Sunday, with leaders Thorpe United Ladies taking on 2nd placed Aylsham Ladies at home. Both sides dropping points last time out a fortnight ago, Thorpe losing for the first time this season whilst Aylsham winning their opening 3 matches drew 2-2 to Sprowston Ladies. Aylsham with a game on Thorpe the gap 2 points going into the game. Aylsham with the narrow advantage at the half-time whistle leading the match 1-0. Thorpe the better side 2nd half despite Aylsham adding a 2nd goal a brace for Aneliese Smith along with a goal from midfielder Laura Hedtke seeing Thorpe to a 3-2 victory to open up a 5 point lead at the top of the table. Mary-Anne Hoy and Sophie Lubbock scoring the goals for Aylsham as they suffer their 1st loss of the season. Sprowston Ladies swap places with Beccles Town Ladies in the Division One table after they met on Sunday, Sprowston in 6th spot looking to build on their draw with Aylsham heading to 4th placed Beccles. Victoria Leyer making just her 2nd appearance of the season found the back of the net 23 times last season, finally opened her account this season scoring a hat-trick as Sprowston climb up to 4th spot courtesy of a 3-1 win. Emily Coe netting the goal for Beccles. The bottom two both without a league point going into the match met at the weekend, Sprowston Athletic Ladies hosting last season’s Champions, Bungay Town Ladies. A frustrating start to the season for both, Bungay not having the fortune nor squad they were blessed with last season. Sprowston Athletic newly promoted as Division Two Champions getting their 1st 3 point haul of the new season with a good result winning the match 4-0. Melissa Belsey, Rachel Bussey, Olivia Leggett and Kate Morris the goalscorers the latter pair both with their 1st goals of the season taking Sprowston Athletic off the bottom of the table. Fakenham Town Ladies excellent start to the season in Norfolk Women’s Division Two continues as they record a sixth straight win to maintain there 100% winning start to the season. At home on Sunday welcomed Gorleston Rangers Ladies to Clipbush Park. A brace from Rochelle Woods, 1 from Fanny Dankskanen her 7th of the campaign and a first goal of the season for Tara Betts seeing the league leaders win 4-1. Lucy Witheridge getting on the scoresheet for Gorleston Rangers her 1st goal of the season. Taverham United Women newcomers to the league this season still unbeaten were at home this Sunday taking on Long Stratton Ladies who were defending a 100% winning start to the league campaign in Division Two themselves albeit their last league game played over a month ago. A close contest Taverham coming away with the 3 points to keep the pressure on leaders Fakenham, Katie Dunning scoring for the 1st time this season and Charlotte Hurren with the winning goals. Beth Stratton scoring the goal for Long Stratton as their winning start comes to an end. Long Stratton dropping to 5th in the Division Two table as Bure Valley Wildcats return to winning ways after 3 straight defeats in the league. That run ending at home on Sunday with Hockering Ladies the visitors. Bure Valley recording their 3rd win of the season a comfortable 7-0 result lifting them up from 6th. Plenty of goals to bring you from the final game to report on in Division Two from the weekend the bottom two meeting with Thetford side Bulldogs Ladies hosting Horsford Women. A tough start to life in the league with both suffering heavy defeats yet to get a point on the board. Horsford the side celebrating that achievement after the match. Had scored just 2 goals prior to this Sunday’s encounter a good first half that saw 9 goals scored had Horsford holding a 6-3 advantage, 4 of those goals coming in a purple patch right at the end of the half that saw nearly 10 minutes of stoppage time played. Bulldogs adding two further goals in the 2nd half, Horsford getting a 7th goal in the final 10 minutes with Elizabeth Moulton completing a hat-trick. Chantelle McTiernan having already acheived that feat for Horsford in the 1st half. Amanda Vincent the other goalscorer for Horsford finding the back of the net deep into 1st half stoppage time. Emma Johnson with a brace for Bulldogs, Sara-Jane Langford with her 1st goals of the season one from the penalty spot. Ineta Omeleviciute also getting her 1st of the season. This entry was posted in Norfolk Women's Division One, Norfolk Women's Division Two, The Round-Up and tagged Norfolk Women's Division One, Norfolk Women's Division Two, The Round-Up on October 31, 2018 by WFEast. It’s raining goals in Suffolk with some very heavy showers in the East Bergholt area as the league leaders continue their 100% winning start to the season with another huge win at home to bottom side Haverhill Rovers Ladies Reserves this Sunday. East Bergholt United Ladies now have an incredible 60 goals from just 6 league matches as they dominated their opponents. Annie Northwood top scoring in the game with for goals. 3 players all celebrating hat-tricks too for East Bergholt, Elena Nitsche, Millie Wilding and Georgia Lockerbie. Jessica Clark with a brace and Charlotte McGrath on target with a goal in a 16-0 win. East Bergholt though need the goals right now to keep their noses in front as they are joined on 18 points by Brantham Athletic Ladies who themselves have six wins from six at the start of the season an impressive goals record themselves with 31 now from their six games whilst defensively the leading pair have conceded just 5 goals between them. Brantham’s latest victory coming on the road as this Sunday they travelled to play Brightlingsea Regent Ladies. Captain, Lucy Dunnett scoring a brace for Brantham, with goals too scored by Danielle Harvey, Jodie Sharp and a 1st goal of the season for Carra-May Seeley. Brantham winning 5-0. A big win on the road too for Walsham Le Willows Ladies on Sunday to see them close the gap on the leading pack in 5th position. Were taking on Chantry Grasshoppers Ladies. Laura Brame getting herself a hat-trick moves onto 5 goals for the season. Norma Locker opening her account for Walsham Le Willows netting a brace. Olivia Hodges also finding the back of the net whilst their were also 1st goals of the season for Julie Brind, Kirsty Pollard and Katie Grimwood as Walsham Le Willows ran out 10-1 winners. Bernice Corney with the consolation goal for Chantry Grasshoppers. In 6th position Coplestonians Ladies young side whilst conceding goals early in the season have nevertheless got 9 points on the board 3 coming courtesy of a home win they have scored just the 2 goals so far this season but each of those goals has been worth 3 points. The latest coming this Sunday at home as they took on Brettvale Ladies. Courteney Farris-Whatling with the goal for Coplestonians in the first half to secure the win. 3 straight wins now for Woodbridge Town Ladies in the league and cup climb up to 7th spot in the Suffolk Women’s Division with a good result on the road against Leiston St Margarets Ladies on Sunday. Woodbridge getting themselves into a 2-0 half-time lead, Leiston St Margarets fighting back 2nd half getting 2 goals, Woodbridge scoring for a 3rd time though enough to see them edge the win by 3 goals to 2. Michelle Stanborough and an own goal for Leiston St Margarets. Goals for Sophie Crane, Kimberley Edwards and Jenna Liverpool winning the game for Woodbridge. This entry was posted in Suffolk Women's Division, The Round-Up and tagged Suffolk Women's Division, The Round-Up on October 30, 2018 by WFEast. It’s sad news to begin this weeks Round-Up with the news that Ipswich Wanderers Ladies are to withdraw from the league. A tough decision for all involved but struggling for numbers to fulfil fixtures the club had little choice. Long time members of the ERWFL they will be missed wishing everyone involved with the club all the best for the future and to those players in their search for a new club. Cambridge City Ladies continue their 100% winning start to the league campaign in the ERWFL Premier Division making it 6 from 6 with victory at home to AFC Dunstable Ladies this Sunday to go 3 points clear at the top. A brace for Erin Davies sees her goals tally move into double figures for Cambridge City. Laura Mills the clubs top scorer also on the scoresheet moves onto 13. Winger, Charlotte Gillies getting a goal to as Cambridge City ran out 4-0 winners keeping their first clean sheet in the league in the process. Also making a 100% winning start to the season in the Premier Division are Royston Town Ladies a 5th straight win for them lifting them up into 2nd spot. Royston’s record looked under threat after they found themselves 2 goals down away from home to former Premier Division leaders Brentwood Town Ladies. A 5 game winning streak for Brentwood seeing the Essex side go top, that run ending last time out away to Bedford, goals from Danielle Butler and Kirsty Knight seeing them make a great start. Royston though were to fight back, Amy Cooper pulling a goal back, Royston’s captain with her 1st goal of the season. Teonie Peyton with 2 goals for Royston on her debut a fortnight ago found the back of the net once again to level things up at 2-2. Hayley Elderd’s 6th goal of the season winning the match for Royston as they come back to win 3-2. Acle United Women climb up to 4th in the Premier Division after victory in Sunday in their Norfolk derby away to Wymondham Town Ladies. A tight contest between the sides Acle getting their noses in front early on, Grace Birchall scoring for the 11th time this season. Managed to keep Wymondham at bay up the other end to claim the win. All very tight in the top half of the Premier Division with 3 points separating 2nd to 6th, Cambridge City know they are all waiting should they slip up. Harlow Town Ladies move onto double figures for the season up to 7th right behind the sides hoping to chase down the leaders getting back to winning ways in the league with victory away to Haringey Borough Women this Sunday. There were braces for both, Lily Bruno and Poppy Binding as the Essex side got the 3 points courtesy of a 4-1 win. League Cup weekend with 4 ties contested in the 2nd Round this Sunday all high scoring affairs with the sides from the Premier Division entering in the 3rd Round. Bowers & Pitsea Ladies travelling to Cambridgeshire to play Histon Ladies. The Essex side going 1-0 up inside the opening 5 minutes with Georgia Fraser on target with the goal. Fraser striking again past the hour hour to double Bowers & Pitsea’s advantage. 4 minutes later Louise Daley found the back of the net to see the 1st half end with Bowers & Pitsea 3 goals to the good. Keeping Histon out the other end, the lead was extended 11 minutes from time, Eloise Ives scoring the 4th goal. A 7 goal thriller between Newmarket Town Ladies and Lawford Ladies in the 2nd Round of the League Cup, a recent 2-2 draw between the sides 3rd and 4th in Division One, Lawford Ladies made the better start getting themselves into a 3-0 lead. Newmarket fought back well getting 3 goals themselves, Brooke Wickens, Jess Linger and Yasmin Woodfield the scorers. Lawford edging the win as they added a 4th goal to see them progress to the 3rd Round, captain Daisy Canny with a brace. Top scorer Jasmine Cox also on target with her 15th goal of the season and making just her 2nd start for Lawford Tess Ryan scored her 1st goal too. It was a 9 goal thriller in Hertfordshire with Hoddesdon Town Owls Ladies hosting St Ives Town Ladies in the 2nd Round of the League Cup. A goalless draw between the sides as they met just a fortnight ago. A total contrast this Sunday both sides on the attack Hoddesdon opening the scoring with Rosy Wodhams making it 1-0 in the 8th minute. St Ives Town coming back to level the scores Tierney Coulson making it 1-1. The visitors going on to take the lead Coulson scoring her 2nd of the game. Hoddesdon’s turn to come back and level it up Grace Leslie firing the ball home from a free-kick to make it 2-2 in the 38th minute. The hosts retaking the lead themselves late in the 1st half, St Ives Town defender, Ellie Brown suffering a dislocated jaw needing hospital treatment. Hoddesdon extending their lead early in the 2nd half Hannah Kelly scoring to make it 4-2 with barely a minute played in the 2nd period. Coulson with a strike from outside the area pulling it back to 4-3 midway through the 2nd half. Into the final 10 minutes St Ives Town were awarded a penalty. Georgia Stancombe sending the ball home to bring it back to 4-4. Just a minute left to play and Coulson with her 4th of the match scoring to turn the game completely on its head and send St Ives Town though with a 5-4 win. Also in the 2nd Round of the League Cup, Hutton Ladies were hosting Division One leaders Stevenage Ladies Reserves. A good first 45 minutes from the Essex side saw Hutton leading the game 3-0. Sydney Webb pulling one back for Stevenage on the hour. Hutton creating chances went on to score three more in the final 20 minutes to ease through to the 3rd Round with a 6-1 victory. Rosi Webb scoring a brace, there were goals for for Sally Appleton, Vicky Kinsman and Kayleigh Franklin with her 1st goal of the season. This entry was posted in ERWFL League Cup, ERWFL Premier Division, The Round-Up and tagged ERWFL League Cup, ERWFL Premier Division, The Round-Up on October 30, 2018 by WFEast. Three games played in the FAWNL Southern Premier Division this Sunday and with only one of the top 4 sides in action it was a chance for Chichester City Ladies up to the dizzy heights of 2nd to claim another 3 point haul and close the gap on leaders Coventry United Ladies to a single point. Back at home after six weeks Chichester were taking on Cardiff City Ladies who were unbeaten in the league since losing on the opening day, with games in hand on all the sides above them too. It was likely to be a close game Cardiff scoring on average 4 goals a game so far this season, Chichester with a good defensive record to match their good start to the season, Molly Clark scoring for the hosts late in the 1st half to give Chichester the lead. Solid in the 2nd half they became the 1st team of the season to prevent Cardiff scoring to win the game and close the gap on the leaders. Cardiff dropping down to 7th in the Southern Premier Division on the back of that defeat the sides below them getting positive results on. Oxford United Women up to 5th on the table with an away win on Sunday against bottom side C&K Basildon Ladies. Florence Fyfe with her 3rd goal of the season scoring to see Oxford lead the Essex side 1-0 in the 28th minute. The game far from settled Oxford defending their goal advantage made the result safe 2 minutes into stoppage time Fyfe netting her 2nd goal of the game to see Oxford return home with the win. A fantastic start to the season from newly promoted Loughborough Foxes Women 7 points from their opening 3 league games was followed by 4 straight defeats that run ending last Sunday with an away win over QPR Women in the FAWNL Cup. Looking to build on that result returned to league action at home to Milton Keynes Dons this Sunday. Captain Shauna Chambers firing Loughborough into the lead just past the half-hour. Charlotte Cooper putting the hosts 2-0 up late in the first half. Loughborough extending their lead 10 minutes into the 2nd half Eva Rogers getting on the scoresheet. 3 quickly became 4 Ria Acton scoring just a minute later. Acton brought down in the box, Laura Steele converting the penalty to see Loughborough 5-0 up with an hour played. Millie Chandarana adding a 6th goal in the final 15 minutes to see Loughborough win and climb back up into the top half of the table. Two 2nd Round ties to be settled in the FAWNL Cup this weekend, both fixtures affected by the weather a fortnight ago. Cambridge United Women were drawn at home to fellow South East Division One side, Leyton Orient WFC. The visitors with chances in the 1st half to get themselves into the lead the sides drawing 0-0 at half-time however it was a hat-trick from Cambridge full-back, Emma Jenkins that sent the host side through. In the right place inside the box from a corner to head the ball home to put Cambridge into the lead. The lead doubled from another corner kick, Jenkins celebrating the hat-trick by getting onto the end of a free-kick to seal the win for Cambridge, who will now face AFC Wimbledon Ladies away from home in the 3rd Round. 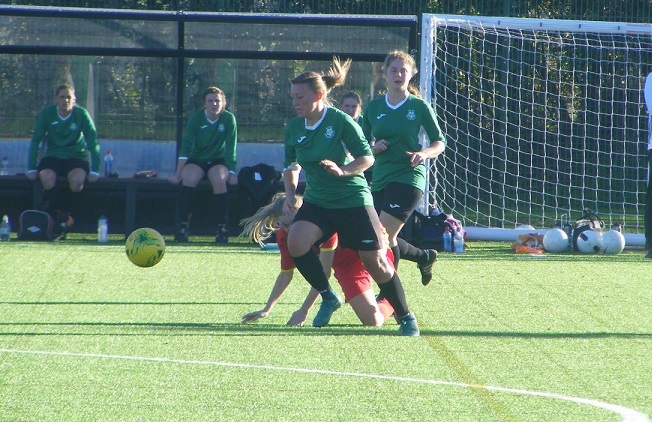 In the other 2nd Round tie Southern Premier Division high-flyers Plymouth Argyle Ladies were on the road taking on Southampton Women currently leading South West Division One with a 100% winning start. A goal from Helen Bleazard the difference between the sides, Plymouth with the lead in the 36th minute. Southampton getting themselves back on level terms on the hour with Natalie Bavister firing the ball home to make it 1-1. The score level going into the final 10 minutes Jessie Jones with a late double to send Plymouth through to the 3rd Round finding the back of the net in the 84th minute to restore the visitors lead adding another in stoppage time to secure the win. A home tie against the unbeaten leaders of South East Division One awaits as Plymouth will take on Crawley Wasps Ladies. The full draw for the 3rd Round of the FAWNL Cup listed below, ties scheduled to be played Sun 9th December. Two games played in the FAWNL South East Division One this Sunday. Crawley Wasps Ladies returning to the top of the table as they continued their 100% winning start to the season with a comfortable result at home to bottom side Luton Town Ladies. Sian Heather opening the scoring 1st half capitalising as Luton failed to clear the ball. The lead doubled from the penalty spot Naomi Cole composed sending the keeper the wrong way. 2-0 up at half-time Crawley added to the score 2nd half Ariana Fleischman turning inside the area slotting the ball in to make it 3. Darcy James scoring from a corner. Megan Stow putting Crawley 5-0 up, Faye Rabson netting fro close range sealed a 6-0 win to return Crawley to the top of the league. Behind the leading pair in FAWNL South East Division One it as extremely tight a win for any side down as far as 7th could see them make huge gains in term of league position and that is exactly what AFC Wimbledon Ladies did on Sunday winning the 3 points to leap all the way up to 3rd position. At home Wimbledon were taking on Denham United Ladies. Rebecca Sargeant putting the hosts into the lead midway through the 1st half, Jenny Nagle adding a 2nd goal for Wimbledon deep into 1st half stoppage time. The lead made more comfortable 10 minutes into the 2nd period with Caroline Bisson scoring her 5th goal of the season. The final score 4-0 Jordanne Hoesli-Atkins scoring with 20 minutes left her 1st goal of the season. This entry was posted in FAWPL Cup, FAWPL South East Division One, FAWPL Southern Division, The Round-Up and tagged FAWNL Cup, FAWNL South East Division One, FAWNL Southern Premier Division, The Round-Up on October 30, 2018 by WFEast. County Cup weekend across the East this Sunday the competition beginning in both Bedfordshire and Hertfordshire. In Bedfordshire there were 3 ties taking place in the 1st Round of the competition. A good start to life in Beds & Herts Women’s Division Three for Langford Ladies leading the way 5 points clear at the top of the table were drawn at home in the County Cup to play fellow league newcomers Kempston Rovers Ladies. A 6-1 win for Langford seeing them advance, Amber Clark finding the back of the net for all 6 of Langford’s goals. Chelsea Rose Jeffery scoring the goal for Kempston Rovers. Also making a good start to life in Division Three are AFC Kempston Town & Bedford College Ladies, 3 wins from 3 played so far were looking to extend that run in the County Cup as they hosted Division Two side Bedford Ladies Development. Chloe Urbanowicz already had 8 goals to her name, added another 4 goals to that tally against Bedford. Zara Garrard also scoring along with Bex Cray in a comfortable 6-0 win. 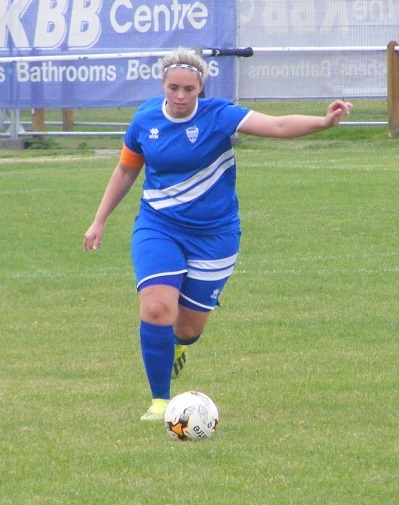 Another new side in Beds & Herts Women’s Division Three also advancing in the County Cup at the weekend, AFC Dunstable Ladies Reserves were away to Luton Town Ladies Development. Goals from Bianca Vassell, Madison Ashford and Holly Wilks with her 1st of the season securing a 3-1 win for Dunstable. 8 ties played in the 1st Round of the Hertfordshire Women’s County Cup this season with a further 3 ties awarded home or away wins, Stevenage Ladies Reserves, Royston Town Ladies and Hemel Hempstead Town Ladies the sides benefiting all going through without kicking a ball. St Albans Ladies causing the upset of the 1st Round knocking out higher league opposition the Beds & Herts Women’s Division One Champions hosting ERWFL Division One side Hertford Town Ladies. Not much football yet for St Albans so far this season just 1 league game. Early goals from Sophie Lawrence and Nicola Dark putting St Albans 2-0 up inside 12 minutes. Jael Muzzi making it 3-0 on the half-hour. Michaela Johnson adding a 4th goal on the hour, before new signing Jessica McNamara made her mark scoring her 1st goals for St Albans a 4 minute hat-trick no less as St Albans ran out 7-0 winners. Another side knocking out higher league opponents in the 1st Round of the Hertfordshire Women’s County Cup were Division Three side Bedwell Rangers Ladies. Were hosting Division Two side Evergreen Eagles, a high scoring game the sides sharing 8 goals between them, 5 went to Bedwell securing the win, a brace from Jessica Sullivan along with goals for Leah Tomlin, Ellie Fennell. ERWFL Premier Division side Colney Heath Ladies got themselves back to winning ways with victory in the County Cup at the weekend. Away to Beds & Herts Women’s Division Two side Wheathampstead Wanderers Ladies a local derby, goals from Lucy Hancock, Nicola Hollick, Sophie Gardner and Charlotte Grogan seeing the visitors progress with a 4-0 win. ERWFL Division One side, Bishops Stortford Ladies also progress in the County Cup victory in the 1st Round their 1st win of the season were hosting Beds & Herts Women’s Division One side Garston Ladies on Sunday. Goals from captain Brogan McHale and Poppy Kelly with her 1st goal of the season sealing a 2-1 result for Bishops Stortford. Two Garston Ladies sides do advance to the 2nd Round of the County Cup. Garston Ladies 2nd XI were hosting Letchworth Garden City Eagles. Like St Albans Ladies a lack of football for Garston’s 2nd XI this season just one league match and that over a month ago, dusted off the cobwebs to win the game 5-1 to progress, Ruby Jager scoring a hat-trick her 1st goals of the season whilst Lauren Berryman also opened her account for the season with a brace. Also in action in the 1st Round of the County Cup were Garston Ladies U18 side, hosting Division Three side Buntingford Town Ladies. 3 goals for the visitors, Garston’s youngsters trebling that tally up the other end to win the tie 9-3. Hitchin Belles were at home in the 1st Round of the County Cup played fellow Division Two side, Evergreen Ladies. A 9th minute goal from Keira How seeing Hitchin Belles leading 1-0 at half-time the win made secure in the final 20 minutes with Katie White and Amy Jack both on the scoresheet to make it 3-0. Also in the 1st Round of the County Cup it was an all Welwyn Pegasus affair with the Azures up against the Sapphires who are top to Division One. The Sapphires in good form proving the strong beating their Division Two club mates 9-0 on the day. Sophie Mandel with her 1st goals of the season and Katherine Calvert both getting a brace. Chemise Huitson, Mary Lisle and Danielle Aken also getting a goal each along with Georgina Harvey and Ellie Burke both finding the back of the net for the 1st time this season. There was one league match played on Sunday, in Beds & Herts Division One, Sharnbrook WFC hosting 2nd placed Houghton Athletic Ladies. A 2nd successive loss now for Houghton Athletic as they were beaten by Sharnbrook who in contrast record two successive wins to climb up into 3rd place in the table. A hat-trick from Claire Smith her 1st goals of the season. There were also 1st goals of the season for, Emily Clark and Jackie Dadd whilst Hoffi Pursey moved onto 5 goals for the season also on target in a 6-2 victory. Ciara Craig and Shakeela Hussain the goalscorers for Houghton Athletic. This entry was posted in Bedfordshire Women's County Cup, Beds & Herts Women's Division One, Hertfordshire Women's County Cup, The Round-Up and tagged Bedfordshire Women's County Cup, Beds and Herts Women's Division One, Hertfordshire Women's County Cup, The Round-Up on October 24, 2018 by WFEast. The 1st Round of the Cambridgeshire Invitation Cup began this Sunday across the county with 5 ties being played. FAWNL South East Division One side, Cambridge United Women were drawn away to play Fulbourn Institute Bluebirds in the competition. Playing 3 leagues higher than their hosts Cambridge were leading 2-0 at half-time, Opening the scoring from the penalty spot Amy Howlett the goalscorer. Becky Shephard making it 2-0. A strong 2nd half performance from Cambridge seeing them go on to rack up a comfortable win. Steph Gale’s strike from distance making in 3-0. Defender Kayleigh-Anne Burt scoring from a corner for 4-0. Captain Kelley Blanchflower getting Cambridge’s 5th goal went on to score at hat-trick. There was a brace for Vicky Neal. Howlett converting again from the penalty spot and Chloe Smith scoring her 1st goal for Cambridge. The final score 11-0. Cambridgeshire Women’s Premiership side, ICA Sports Ladies went one better than Cambridge in their 1st Round Invitation Cup tie, scoring 12 goals to win comfortably away from home against Burwell Tigers Ladies on Sunday. Jessica Farchina top scoring in the game netting 4 goals for ICA Sports, 3 players all getting a brace, Carmen Herridge, Donna Nicholls ad Kylie Armstrong. Megan Purnell and Zoe Leddy also getting a goal each. The final score 12-2. Charlotte Forgarty and Elisa Heinamaa with the goals in each half for the Championship South side. Plenty of goal elsewhere too in the Invitation Cup 1st Round, ERWFL Division One side, Histon Ladies were away to Isleham United Ladies from the Championship South. Sophie Lanham’s free-kick putting Histon into the lead in the 14th minute. Alison Wright doubling the lead just 3 minutes later would go on to complete a 1st half hat-trick, Brie Baker and Georgia Day both getting a goal each to see Histon leading 6-0 at half-time. Isleham pulling a goal back early in the 2nd period, Histon soon extending their lead, Charlotte Westhorpe making it 7-1. Becky Finch scoring her 1st goal of the season an own goal seeing Histon advance comfortably the final score 9-. 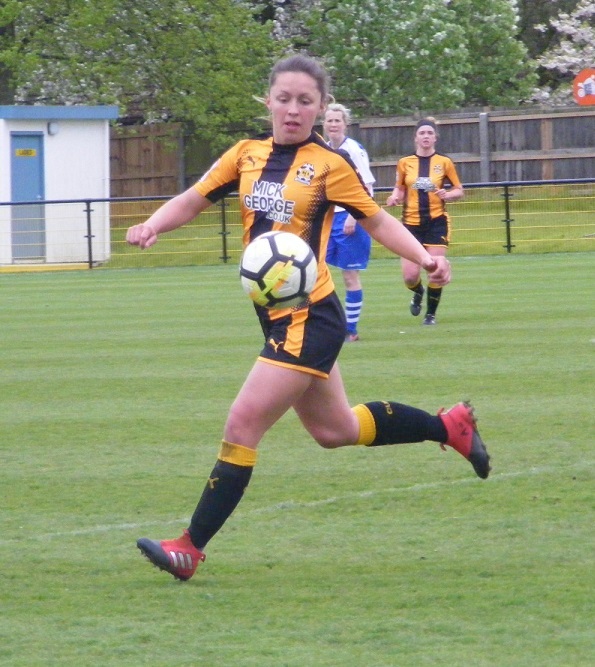 ERWFL Division One newcomers, Newmarket Town Ladies were hosting Cambridgeshire Women’s Premiership side March Town United Ladies in the 1st Round of the Invitation Cup on Sunday. A 2-0 lead for Newmarket at half-time went on to make the result comfortable in the 2nd half adding a further 5 goals to win the tie 7-0. Both Brooke Wickens and Cassandra Carvalheiro scoring twice in the game with Jess Linger, Sarah O’Rourke and Jodie Woodfield all getting a goal. Championship North versus Championship South in the other 1st Round Invitation Cup match played on Sunday. Wisbech Town Ladies at home playing Cambridge Rangers WFC. The visitors taking the lead going 1-0 up early in the match. Wisbech Town coming back to level the scores with Kaylie Swinden firing the ball home. Again Cambridge Rangers came back to lead the game, Were pegged back to 2-2 with Chloe Stanborough equalising for Wisbech Town drawing at half-time Wisbech Tow the stronger side 2nd half, Sophie Swinden putting the hosts into the lead for the 1st time in the match. Leah Hall extending the advantage with both Stanborough and Sophie Swinden scoring a 2nd goal each to see Wisbech Town win the game 6-2. One game played in the Championship North at the weekend with the bottom pair meeting on Sunday, Pinchbeck United Ladies up against Hungate Rovers Ladies, the sides contesting a 2-2 draw to both earn their 1st point of the season. One game too in the Championship South with leaders Haverhill Rovers Ladies hosting 2nd placed St Ives Town Ladies Development. Haverhill Rover with a 100% winning start to the season, St Ives Town 6 points behind succeeded in closing the gap to 3 points ending Haverhill Rovers unbeaten start to the season winning the game 3-1. Hannah Seymour-Shove scoring a brace for St Ives Town with Fran Chapman also finding the back of the net. Kayleigh Nolan scoring the goal for Haverhill Rovers. This entry was posted in Cambridgeshire Women's Championship North, Cambridgeshire Women's Championship South, Cambridgeshire Women's Invitation Cup, The Round-Up and tagged Cambridgeshire Women's Championship North, Cambridgeshire Women's Championship South, Cambridgeshire Women's Invitation Cup, The Round-Up on October 24, 2018 by WFEast.